South College celebrated the graduation of 23 School of Nursing students on March 28 at the Bijou Theatre in downtown Knoxville. 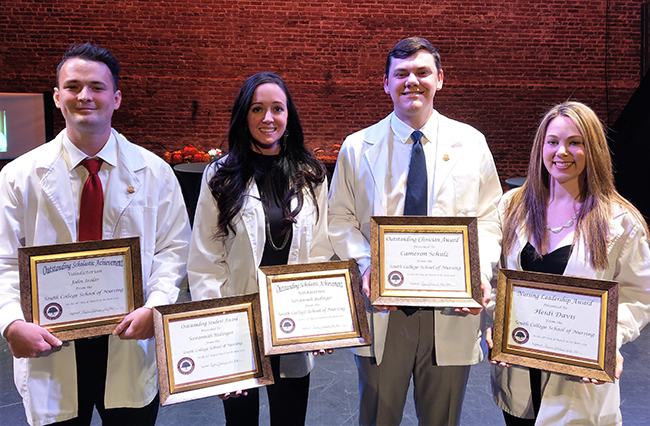 High achievers include, from left, John Iroler, valedictorian; Savannah Ridinger, salutatorian and Outstanding Student award winner; Cameron Schulz, Outstanding Clinician award winner; and Heidi Davis, Nursing Leadership award winner. South College celebrated 23 graduates of its nursing program at a convocation ceremony March 28 in Knoxville and also recognized outstanding achievement in the March Class of 2019. The event, held at the historic Bijou Theatre, paid homage to nursing traditions while focusing on the ongoing success of the South College nursing program. The convocation included a pinning ceremony, which is a rite of passage for nursing students. Each graduate walked across the stage in a white coat and received a pin as an official welcome into the nursing profession. “The pinning ceremony is the pinnacle of a nursing student’s time with us, and you could see the pride on the faces of the honorees, parents, friends, faculty, and staff,” Shuffitt said. From Lincoln City, Oregon, Davis attended South College to obtain a Bachelor of Science in Nursing (BSN), which will enable her to become a Nurse Corps Officer in the U.S. Navy. Davis, a model student, also served as a mentor to her classmates. The convocation honorees will receive BSN degrees at the college-wide graduation in June. The next convocation, planned for September, will also feature the first graduation class of Licensed Practical Nursing (LPN) students from South College’s new LPN program that started in 2018. For more information about South College, visit www.south.edu.